Versatility update: I had to pull a few rows back because the original pattern omitted the bobbles in the written instructions for row 23. 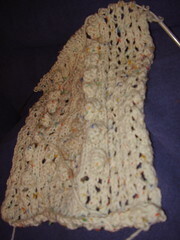 But I've redone it and completed row 10 of the repeat. My worries about this pattern being too complicated for my concentration span have been mostly unfounded; I'm enjoying it.